The G-Towel Center Cut Towel is the ultimate golf towel. 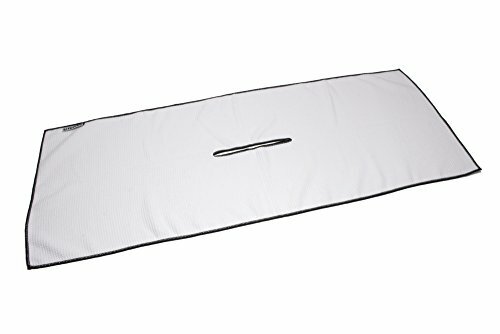 The 16"x40" size and elongated center hole cut drapes easily over your bag and clubs for easy access from all sides. It is lightweight, even when partially wet. If you are taking a cart it is easy to remove to carry with you to the green. When putting or chipping you can lay it down as a place to keep your grips dry and clean. The waffle weave microfiber fabric is extremely absorbent and has great cleaning ability. You can wet one third of the towel for cleaning club heads and your ball, and the dry side can be used for cleaning or drying your hands and grips. SIMPLE DESIGN - The 16"x40" with a center hole cut, drapes over your carry bag, and through your clubs to make access a breeze. Riding in a cart? Take your G-Towel with you to the green and lay your putter and wedge grips down to keep dry. Walking? Keep your towel draped through your clubs to keep down chatter and easy access. POWER OF MICROFIBER - The microfiber waffle weave material is super absorbent and extremely effective at cleaning grips, grooves, and club heads. Keep one side of the towel dry for drying your hands and grips, and the other side damp for cleaning club heads and grooves. The waffle weave material doesn't pick up loose debris that can attach to other fabrics. LIGHTWEIGHT - Weighing in at 6 ounces dry, this golf towel is not bulky or heavy, even when one end is wet. Carry your G-Towel on your bag without worrying about adding weight to your bag. YOU ARE A PLAYER - You don't have a caddy, you are here to play some G. So you need a simple and effective towel design to keep your sticks in prime scoring condition. That means dry hands, and clean grips, and grooves free of mud and grass. A true players towel. 100% SATISFACTION GUARANTEE - If you are not satisfied with your G-Towel golf towel then we will replace it or give you a full refund.